National statistics say approximately 30 teens are injured in motor vehicle crashes involving an inexperienced driver about every hour, and each day, seven will die in those collisions. Many of the accidents are preventable if only teens would slow down and wear their seatbelts, Shirk said. Robert Gilmer, an Alive at 25 instructor, asks participants how to stay safe in various driving situations during a group discussion. New driver education is particularly important now when so many schools are essentially eliminating driver’s education from their curriculum, leaving parents to teach their teens on their own, Shirk said. “The course really encourages dialogue between the parent and child around good decision-making on issues like speeding, wearing a seatbelt and cell phone use,” she said. Participant pairs watch a video that presents a driving scenario and then talk together about appropriate behavior. Students also get a turn behind the wheel of the trauma team’s newest teaching tool, One Simple Decision. Like a video game with a steering wheel, the simulation-based program tracks and displays driving violations, including speeding, swerving, running stop signs and driving in the bike lane. 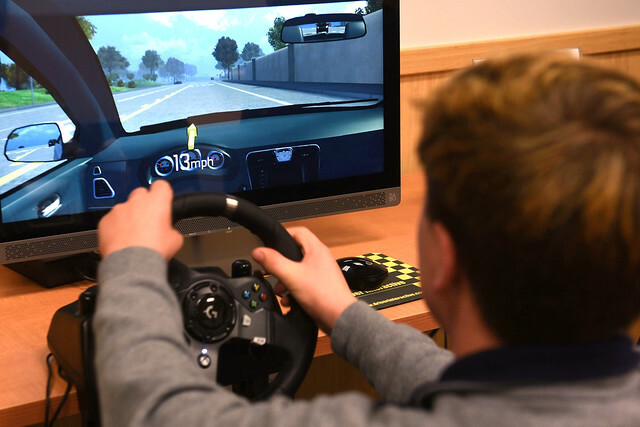 “Data suggests the use of driving simulation is effective in behavior modification with teen drivers,” Bollinger said. The Trauma Community Outreach team plans to use the driving simulator, purchased with funding from the Association of Faculty and Friends of the Milton S. Hershey Medical Center, in the community and in local high schools, she said. Shirk applauds parents like Batra who monitor their teen’s driving even after a license is earned. Parents know firsthand how their teens are driving during the learner’s permit stage, but parents should stay involved to ensure their kids are wearing seatbelts, not driving after the state-mandated curfew of 11 p.m. and not driving a carful of friends, she said. That means Mom and Dad, too. Shirk said that kids watch their parents from the moment the car seat is turned around and will likely model their driving as well. Entry filed under: Features. Tags: Alive at 25 program, pediatric trauma, Penn State Children's Hospital, teen driving.